Considered ways to 'bump' a child on a waiting to speed up their assessment? These are a few of the scenarios faced by clinicians in neurodisability on a daily basis. 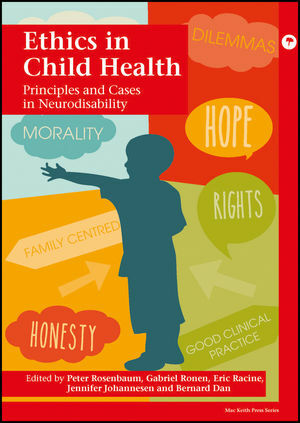 Ethics in Child Health explores the ethical dimensions of these issues that have either been ignored or not recognised. Each chapter is built around a scenario familiar to clinicians and is discussed with respect to how ethical principles can be utilised to inform decision-making. Useful ""Themes for Discussion"" are provided at the end of each chapter to help professionals and students develop practical ethical thinking. Ethics in Child Health offers a set of principles that clinicians, social workers and policy-makers can utilise in their respective spheres of influence. Professor Peter Rosenbaum MD FRCP(C) is Professor of Paediatrics at McMaster University and the CanChild Centre for Childhood Disability Research, Ontario Canada. Professor Gabriel Ronen MD MSc FRCP(C) is Professor of Paediatrics at McMaster University and McMaster University Children's Hospital, Ontario, Canada. Eric Racine PhD is Director of the Neuroethics Research Unit, Associate Research Professor and Associate Director, Academic Affairs of the Institut de recherches cliniques de Montréal, Quebec, Canada. Professor Bernard Dan MD PhD is Professor of Neurophysiology and Developmental Neurology at the Université libre de Bruxelles (ULB), and Director of Rehabilitation at Inkendaal Rehabilitation Hospital, Belgium. Jennifer Johannesen MsC is an author, writer, speaker, and parent. Paul C. Mann, Russell P. Saneto and Sidney M. Gospe Jr.